Beautiful Belitung ~ this anomal life. costed $60 per person, round trip. Belitung is a very affordable getaway from Jakarta. It became famous from an Indonesian movie called "Laskar Pelangi" which was shot on this island. We stayed for 2 nights at BW Suite Belitung. Our transportation was arranged prior to our arrival. Mr. Ono +62 819-7781-4235 - he arranged the tour packages. Mr. Ferry +62 817-898-422 - he works under Mr. Ono and was our driver for the trip. This included the vehicle, driver, boat tour, snorkel and goggles, lunch for the boat tour, bottled water for the boat tour. Mr. Ferry picked us up from the airport and also dropped us there for the flight back. We started off our tour at a makeshift school that was featured in the Laskar Pelangi movie. I don't really understand the reference, to be honest, as I have never watched the movie. Belitung is also known as the birthplace for Jakarta's outspoken governor, Basuki Tjahaja Purnama, known as "Ahok" to Indonesians. We visited the village that he grew up in. We then went for lunch at a local seafood restaurant by the beach on the Eastern side of the island. The east side is not as picturesque as the west, our guide told us. Tourists usually only spend little time here as there is not much to see. I saw this calf running free around the field. I assume he broke free from his rope and was exploring. It was actually raining really hard for a few hours until it finally became sunny. The pool at the BW Suite it's quite small but had a nice view of the ocean. The next day, we embarked on our boat tour. The water was a little choppy that day. The first destination was Pulau Batu Berlayar, as pictured above. The water was beautifully clear and blue. Unfortunately, my mom and little brother could not join us. My little brother got sick with a nasty bug and he was way too sick to come on the boat. The sea was a little choppy today, but still we saw the beautiful colour of the water. Here we are at Pulau Pasir. During low tide, you can find a lot of starfish here. The water was very warm. Huge starfish--first time I have held one in my hand. Our guide and my brother on the right. and it is still operational today. The awesome view from Pulau Lengkuas. The view from the top of the lighthouse is pretty sweet. The other boats that docked here. After leaving Pulau Lengkuas, we headed to our snorkelling destination nearby. It wasn't the best conditions due to the wind but I was still impressed by the healthy condition of the coral. My brother is a much better swimmer than I am. There were some really cool species, including clownfish down here. After lunch, we headed to Pulau Tanjung Kelayang. As you can see, rain clouds started to move closer and closer. It rains a lot in Belitung. 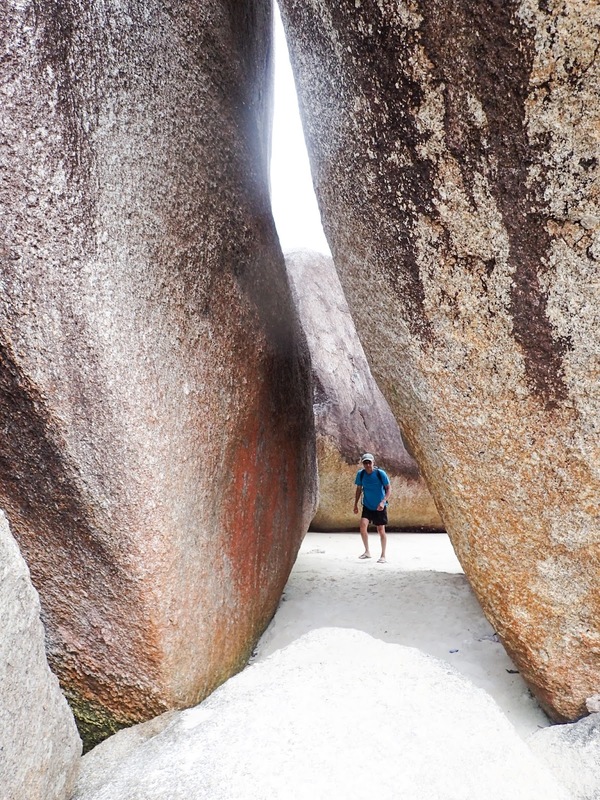 On Pulau Tanjung Kelayang, they have towering granite formations. It was quite a sight. After returning back on the main island, we headed to Pantai Laskar Pelangi (also known as Pantai Tanjung Tinggi). It got really cloudy, unfortunately. We visited the mangroves for a bit. Lots of very cool creatures here. Crabs, mudskippers, fish...wish we could have stayed there to go fishing. This place is supposedly a crab farm. They're building this site for some sort of scout festival in the future. Last destination before we leave for our flight is Kaolin Lake. Kaolin Lake is actually formed by water pooling inside craters created from clay mining. The mine itself is still used today, thus, the owner does not allow people to go down to the crater area without permission as the ground here gives away very easily. Even though it resembles a sulfur lake, it is not geothermal or anything of that sort. It is quite beautiful but slightly tragic at the same time seeing how much mining can damage the earth. My little brother was feeling better today. That's all for Belitung. Though the islands around it are insanely beautiful, the main Belitung island does not have much going for it. The hotels are still very average, no major resorts just yet. The boat tour and island hopping was definitely the highlight of the trip. However, I don't think Belitung is a place that you can enjoy twice. Maybe after further development, there will be more interesting tourist attractions here. Despite that, you should visit Belitung at least once if you're ever in Indonesia!